Junior Morias heads home the Posh equaliser against Oldham. Photo: Joe Dent/theposh.com. 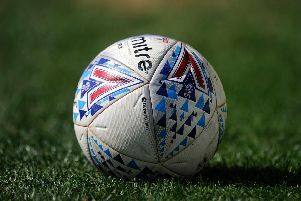 Peterborough United were held to a frustrating draw by lowly Oldham at the ABAX Stadium today (March 18). Posh played solidly in the first-half, but reached the interval a goal behind to Lee Erwin. Posh full-back Andrew Hughes gets to grips with Oldham's Paul Green. Photo: Joe Dent/theposh.com. Posh were poor after the break against cynical opponents, but found an equaliser 17 minutes from time through substitute Junior Morias. There were a couple of surprise before the game when the absence of key Posh men Ryan Tafazolli and Luke McGee was revealed. The pair had made over 70 consecutive appearances between them. Bostwick replaced Tafazolli at the heart of the Posh defence with Anthony Grant returning to midfield. Mark Tyler, at the age of 39, was called up to play in goal for the first time since September 3. The last thing a team needs when faced with this Oldham team is to concede first. The Latics have a remarkable defensive record for a team so low. Scoring goals have been more of a problem. Posh striker Craig Mackail-Smith shares a joke with Oldham's Peter Clarke. Photo: Joe Dent/theposh.com. But it took them just 11 minutes to open the scoring here. A floated cross defeated Michael Bostwick and Erwin, a scorer of two goals in midweek, volleyed expertly past Mark Tyler. Posh had been denied on four minutes when Paul Taylor’s excellent pass was taken superbly by Michael Smith. He drove into the penalty area before forcing a fine save from Connor Ripley. And Posh went on to dominate the rest of the half against a team happy to sit deep and slow the game down at every opportunity. But creating chances was tough. Craig Mackail-Smith profited from more good Taylor work, but his shot was smuggled, rather fortunately, past a post by Ripley. Mackail-Smith slid a shot wide on the stretch after a fine Smith pass, while Tom Nichols volleyed a corner over the bar from close range, while under heavy pressure. Andrew Hughes glanced a couple of headers wide from set-pieces. Posh made an enforced change at the break with the in-form Taylor replaced by Marcus Maddison. Posh started the half poorly as Oldham continued to slow the game down, but Morias’ introduction for Nichols pepped the home side up. And the two substitutes’ combined for a fine equaliser that came right out of the blue with Morias heading in Maddison’s fine left wing cross. Morias almost scored again four minutes later after Mackail-Smith chased Maddison’s superb long ball and squared it into his path, but a low shot just grazed a post.